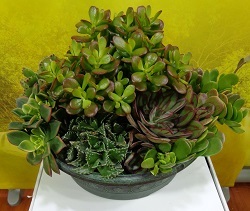 SUCCULENT COMBO BOWL Succulents are a group of plants which includes hen-and-chicks, echevarias, sedums, aloes and agaves, to name a few. The outstanding characteristic of this diverse, intriguing, and increasingly popular group of plants is drought tolerance. They come in many striking forms and unusual colors. Succulents require little maintenance and thrive in sunny, well-drained beds or containers. Many varieties are winter-hardy, but some are not and must be wintered indoors. Some also make great houseplants. Mixed succulents planters are gaining increasing popularity due to easy care, drought tolerance, and low maintenance. 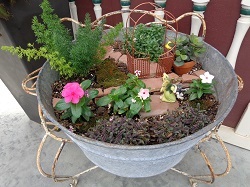 Miniature and Fairy Gardens have been gaining in popularity over the last several years. This is a fun and exciting way to introduce gardening to children and beginning gardeners, as well as for more experienced gardeners who just want to try something new or who have limited space. The possibilities are endless with many well-known varieties of plants that are perfect for small spaces and new varieties coming out each year. The accessories and containers that can be used are only limited by one’s imagination. The Original Atlas Gloves are made with a tough Nitrile coating, a breathable nylon liner, machine washable, great for the flexibility you need for any job requiring gloves, comfortable and extremely durable. The colors are pink (as shown), purple, light green and sky blue. 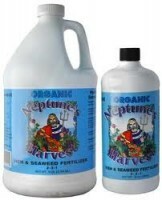 BENEFITS OF FISH/SEAWEED 2-3-1 Neptune’s Harvest Organic Fish/Seaweed Blend Fertilizer gives you the best of both products with a perfect blend of fish hydrolysate and seaweed, ensuring a complete fertilization program. Growers using our fish/seaweed blend fertilizer on a regular basis have reported increased marketable yields and improved shelf life on fruits and vegetables. Fish and Seaweed are known to build the natural sugar in plants. Flowers and foliage will be stronger and more colorful. Blooms will be more plentiful, fragrant and longer lasting. 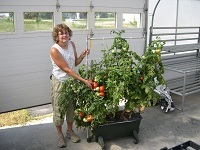 This self-watering container makes it easy to grow thriving flowers, fresh herbs, or juicy red tomatoes and is ideal for home or classroom use. The EarthBox has a 3-gal reservoir that holds a weekend’s worth of water and special channels in the base that wick moisture upward as your plants need it, eliminating over- and underwatering. 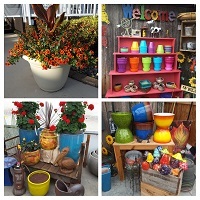 Cottage Gardens has a wide variety of colorful gifts, garden decor, and colorful tropical plants. We also have many styles of pre-planted containers for customers to choose from. Custom planting of your containers can also be arranged. Orlandi is the finest in fiberstone statuary. Each piece is molded from an original sculpture and finished by hand. Stronger and more weather resistant than cement, these pieces will last! Several finishes available.